I was reading on Pronet Advertising that URL’s Matter. Basically the article states that because Pronet Advertising had three different URLs to the same thing listed in del.icio.us they didn’t hit the top of the ‘popular list’. If all the del.icio.us bookmarks had used the same URL, Pronet Advertising would have been much more successful. The article does a good job describing the problem. More than 3,000 people bookmarked the site but three distinct addresses were used. The article suggests using redirection to make sure that all users see the same page. So for example, if the visitor comes in on http://playingwithwire.com, he or she should be redirected to http://www.playingwithwire.com. This is sensible but it isn’t enough. Imagine if you have a blog like we do. The article you are reading right now actually appears in three different places, each with a differnt URL! For a while it will be on our front page. It will also be in our archive page for this month. And finally it has its own post page. Ultimately you want everyone to bookmark your posting page because that’s where the article ‘really’ lives. Enter Cuzimatter. By using our clever social bookmarking utility you can ensure that most users bookmark exactly the same page URL, regardless of if they read it from your front page, your archive, your post page, your alternative URL, someone else’s mirror – anything. 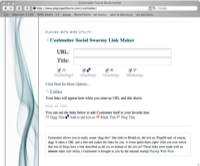 The Cuzimatter links happily follow your blog post around and make sure bookmark happy users end up bookmarking your page. so no matter where you are looking at the blog post from, you’ll link to that post’s page? there still seems the problem of people adding your front page to delicious. i always tend to use my firefox plugin instead of clicking on people’s “add to delicious” links. Yeah unfortunately if people use their Firefox button they might still end up bookmarking your frontpage rather than the actual posting. But at least having this kind of link available will make things better.